4 Day 5 – 7: Stellenbosch, The Cape Wine Lands, 3 nights. Road Trips in South Africa are a wonderful and perfectly safe way to explore this beautiful country. Rosie and I do it as often as possible. One can even go on malaria free jeep safaris with the little ones. The country has a wide range of accommodation that is suitable for travelling with kids. We recommend to not travel super long distances. Also stay 4 or 5 nights in one place to ensure some quiet time as well. Here is our plan for your family travel to South Africa with many highlights included. The South African road trip that we suggest below includes highlights like Cape Town, Garden Route, a private Big 5 safari and Addo Elephant Park. Oh and in case you’re looking for other countries for great road trips, here’s a list of 22 Best countries for Road trips. This post contains affiliate links. Read more about this in our disclaimer HERE. Get the best car rental quote HERE. Compare 900 companies in over 53.000 destinations. Best price guaranteed! Hout Bay is a great place to base yourself when you’re exploring the greater Cape Town area. 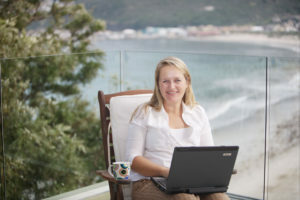 It offers a lot of different types of accommodation, it is usually a bit cheaper than accommodation in the city of Cape Town and it offers a lot more SPACE which is important when traveling with little ones. We can highly recommend Riverside Boutique Hotel which offers all of the above. Click HERE to book this accommodation. In case you rather stay in the middle of the vibe, in the V&A Waterfront you can stay in the amazing RadissonRED Hotel with the coolest family rooms. The bunk beds for the kids each have their individual flat screen. You will have easy access to restaurants and might opt to not rent a car for the days in Cape Town. Click HERE to book this super hip and happening hotel with roof top food truck and all. In case you would like book some activities we highly recommend the Cape Town Sightseeing Bus tour which is fun for the entire family. It offers a special tour for children. Day 5 – 7: Stellenbosch, The Cape Wine Lands, 3 nights. A lot of families traveling to South Africa, believe that they should not visit the wine lands with their small ones because there’s nothing to do for the children. Nothing is less true. The Cape Wine lands are fantastic to visit with children and many places offer special treats for kids, activity books and special kids activities. We love Spier Wine Estate and Hotel which welcomes children of all ages with open arms. It is a large property with a lot of different things on offer, huge lawns with play areas and so much more. There are 2 restaurants, you can create your own picnic, the children can taste grape juice while you sip wine and SO much more. 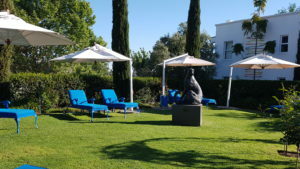 It is really a fantastic family hotel in the Cape Wine lands that has something on offer for everyone. While I was tasting wine, Rosie was given an activity booklet which is ALWAYS such a winner with small kids. Loved it! Check HERE for the best rates at Spier Wine Estate and Hotel. Another great place to stay with children is at Majeka House. We especially enjoyed the pool suites with a pool right outside of our room. There is also an indoors pool so kids can ALWAYS swim no matter what the weather is like. This place I can highly recommend for parents who LOVE really good food. The restaurant has won many great awards and the bar area serves delicious tapas style dishes all day long. Breakfast is a true feast. Mindless to say we indulged in ALL of this Big time! Click HERE to book Majeka House for you and your loved ones! Today you continue your South African Road trip onto the famous Garden Route. Going on a safari is one of the big reasons why people visit South Africa. 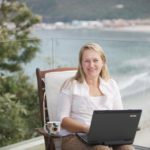 South Africa offers many different options and a lot of them have really upped their game (pun intended…) with regards to children’s activities. Some offer a special program for kids and it is a wonderful way to teach kids about nature conservation and have an unforgettable adventure at the same time. On the Garden Route, the most special place to take the kids would be Gondwana Private Game Reserve. Other good option are Garden Route Game Lodge, Botlierskop and off the Garden Route, a bit more land inward close to Montagu is the amazing Sanbona Wildlife Reserve with a special lodge dedicated to families. Another lovely, lovely guesthouse in Wilderness right by the beach and in walking distance from the village is Wilderness on Sea B&B. It is run by a lovely mother / daughter team, the rooms are spacious and breakfast is served in the nice garden. We SO enjoyed our stay here. Book you next holiday in Wilderness HERE. 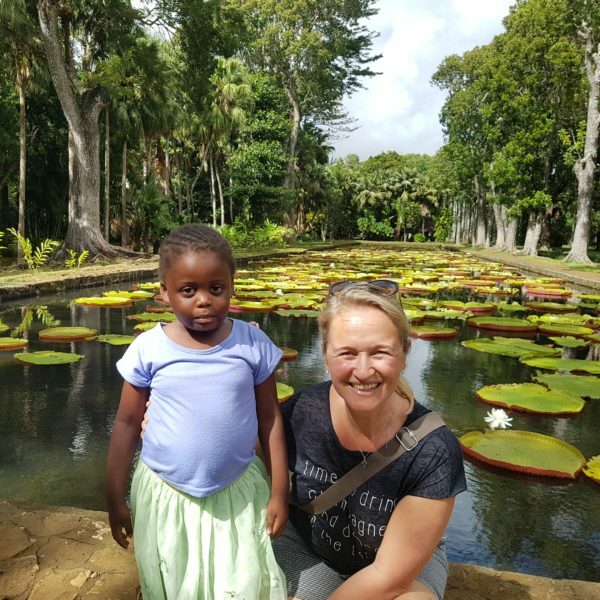 There’s so much to do on the Garden Route and especially with children. There’s the Knysna Elephant Park, Birds of Paradise, Monkeyland and of course Tsitsikamma National Park with Storms River Mouth. 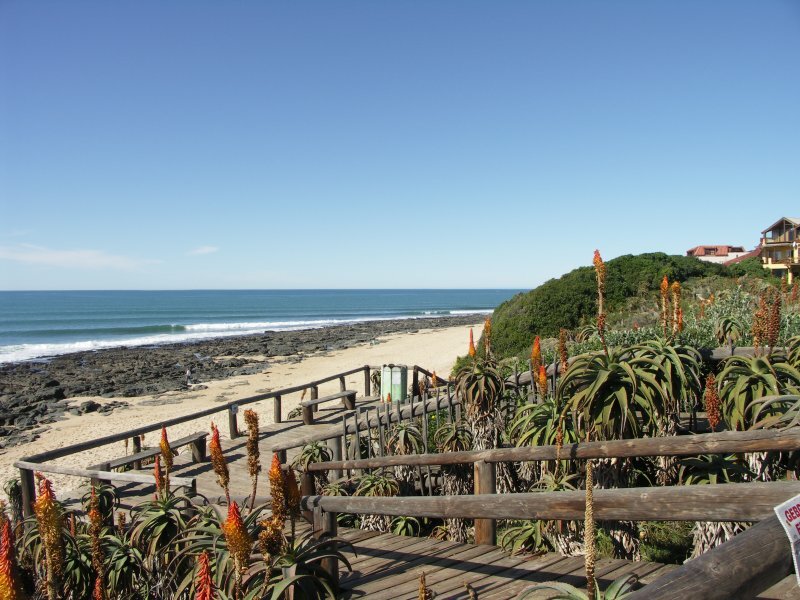 We suggest you visit these on your way to Cape St Francis and just take the whole day to get there slowly. At Storms River Mouth you can walk over the suspension bridge and can take a beautiful boat ride into the gorge. Cape St Francis has a great beach for the children. We loved staying at the Cape St Francis Resort for which you can make a booking HERE. South African National Parks offers beautiful accommodation inside the park and we suggest you book any of their cottages. It is mainly self catering so make sure to do your shopping before you enter the park. Enjoy the views over the mountain on your private patio while preparing dinner over a relaxing fire. This unit has 2 separate bedrooms with open plan living area and a separate bathroom. The kitchen is fully equipped, includes both, a microwave, and a conventional oven, as well as all the other necessities to make your stay as comfortable as possible (Sleeps 4 people). Make your bookings for Addo Elephant Park HERE. Addo Elephant Park is a beautiful national park and FULL of, guess what, elephants! You would be really unfortunate if you don’t see any elephants. Make sure NOT to have any oranges in your car because the elephants love them. The Sunday River Valley is also known for the many citrus farms so perhaps a farm visit would be fun with the kids. This itinerary finishes in Port Elizabeth so from here you can either fly back to Cape Town or fly to Johannesburg or Durban to continue your South African Road trip from there. OR if you have more time you can drive back via Route 62 and visit places like Oudtshoorn, Montagu and the Robertson Wine area on your way back to Cape Town. This entry was posted in road trips, Tours and tagged garden route, road trips.